In 1937 in the city of Monroe, Michigan, workers at the Newton Steel Plant picketed and later went out on strike. Most workers and residents did not expect their quiet town to become a major battle ground in the American labor movement and the center of national attention. In March, 1937, the Committee of Industrial Organizations, or CIO, successfully unionized over 200,000 steelworkers employed by U.S. Steel—“Big Steel”—and negotiated a contract. The CIO won a battle with a corporate giant, and gained almost a quarter million new union members. The CIO’s follow-up strategy was to unionize workers employed by Little Steel. “Little Steel” companies were the remaining non-union steel companies, not owned by U.S. Steel or one of its subsidiaries. The CIO targeted three major Little Steel companies: Republic, Inland and Youngstown Sheet and Tube. Each had refused to sign union contracts with the CIO. Whether or not the CIO mounted an organizing campaign against the remaining two Little Steel companies, Bethlehem and National Steel, depended largely upon the outcome of the drive against Republic, Inland and Youngstown. The Little Steel strikes of spring and summer 1937 occurred in seven states and affected over 70,000 workers. Republic’s Newton subsidiary in Monroe was a small piece within a larger framework. 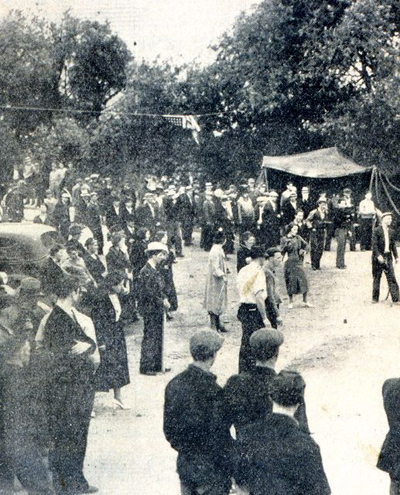 Monroe’s Little Steel strike erupted in violence, and drew national attention. Monroe was cast into the national spotlight. The strike changed Monroe, and the national labor movement. Newton Steel formed in 1919 in Youngstown, Ohio and built its first sheet steel mill in Newton Falls, Ohio. In the late 1920s Newton decided to expand operations into the Detroit area. The city convinced Newton to build its new Michigan plant in Monroe. The plant was a significant addition to the other established industry in the city, paper mills, the employer of many local residents. The steel mill construction began in 1929 on the northeast side of Johnson’s Island. The $8 million plant opened in 1930. Newton’s original budget for development exceeded $60 million but due to the stock market crash of September 1929 other expansion stopped. Many employees at the Monroe plant had relocated from Ohio, and moved to Michigan when Newton expanded operations in Monroe. Newton experienced financial difficulties due to repeated heavy losses over a period of years and merged with Corrigan-McKinney Steel Company of Cleveland in 1932. Corrigan-McKinney became a heavy creditor and acquired control over Newton when it advanced money to meet Newton’s losses. In 1935, Corrigan-McKinney merged with Republic Steel. During the same period, labor relations at the Newton plant were largely peaceful, but minor strikes occurred in 1933 and 1935, the first to seek restoration of a 20 % pay cut and the second to restore the helpers on the hotmill. Growing labor unrest seemingly coincided with each successive merger. Mergers apparently ushered in a new management style and corporate mentality, which began to alienate the Newton workforce. The CIO was a national labor organization that formed in November 1935. It was originally called the “Committee for Industrial Organization and was an educational group within the American Federation of Labor (AFL). The CIO promoted industrial unionism. In 1886, thirteen national unions formed the American Federation of Labor, or AFL, which was a labor organization that primarily represented skilled workers. These skilled occupations were referred to in the nineteenth century as “crafts.” Although the AFL did include unskilled laborers in its membership, the federation favored skilled craft unionism. But as America became more industrialized in the early twentieth century, mass production industries emerged, requiring a larger, less-skilled workforce in comparison with the number of traditional AFL members in craft unions. Eight member unions that were in the AFL formed the CIO. Original founding members included major national unions representing mine workers, typographical employees, and the garment trades. The CIO, the confederation of national unions within the AFL, was viewed as a rebel movement once it began organizing workers in mass-production industries. For a time both parties coexisted, but internally the AFL had fractured. In 1936, the relationship worsened when the AFL ordered the CIO to disband and cease its organizing drives, or face suspension. By the end of the year, the CIO had been banished by the AFL. The situation was irreconcilable and the CIO marked its full split with the AFL in 1938 by changing its name to the Congress of Industrial Unions. The American labor movement was split from the mid-1930s through the mid-1950s between the AFL and the CIO regarding how best to organize workers, and how best to represent those worker unions. Eventually the ideological differences between the two organizations lessened, until they merged as the unified AFL-CIO in 1955. The AFL-CIO fragmented again due to internal disputes over organizing strategy in September 2005, when seven unions withdrew from the federation, and formed Change to Win. IS VIOLENCE COMING TO MONROE? Prior to 1937, Monroe was largely immune and somewhat isolated from the larger labor struggles of the 1930s. Monroe, “The Floral City,” was a tranquil community, last touched by mass violence during the battles of the River Raisin in 1813. Bloodshed and death occurred at Republic’s South side Chicago plant only two days after Monroe’s picket lines formed at Republic’s Newton Steel plant. Undoubtedly, people soon to be on opposing sides of the struggle yet to come in Monroe could agree on one thing: most people feared the violence witnessed in Chicago and elsewhere, and wanted no part of it here. Before the strike, there were already two steelworker unions in Monroe. One was the Amalgamated Association of Steel, Iron and Tin Workers, the Monroe lodge of the CIO SWOC union. This was the union that would strike. The other union was the SWA, the independent “company” union of Newton workers not affiliated with the CIO. 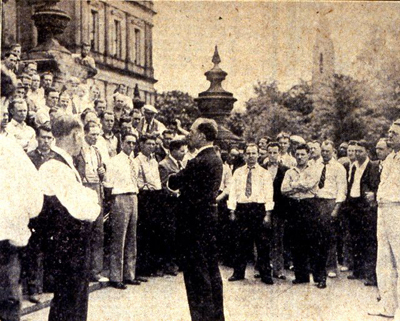 SWOC started the strike by picketing the plant on Friday, May 28, 1937. By midnight, Republic decided to shut down the Newton mill. Monroe was now stuck between two groups of workers, the smaller SWOC group that picketed and ultimately influenced Republic’s decision to close, and the larger SWA group that was now out of work—not by choice. And the strike was only one day old. After the line was broken, UAW workers in the tri-state area threatened to descend by the thousands on Monroe to shut down Newton Steel and re-establish the picket line. Monroe would defend itself against invaders who had no business in the city. No union was going to take over Monroe without a fight, and all outsiders were barred from entering town. As many as 200 hundred autoworkers from Pontiac drove toward Monroe on June 11. They ultimately turned around near Ready Road, 10 miles north of the city, and drove home. UAW President Homer Martin apparently called the state police and instructed troopers to turn the caravan around. Monroe remained secure. After Homer Martin threatened to invade Monroe with 100,000 union auto workers, tensions ran high between the CIO and the city. Governor Murphy negotiated an arrangement agreeable to the city, the union, and law enforcement. The agreement allowed a CIO rally to be held on Sunday, June 13. To reduce tension, the mass meeting was deliberately held outside of Monroe at the state park. Further, the national guard and additional state police were detailed to Monroe to keep the peace. On Tuesday, June 15, SWOC director Charles Kiser and Mayor Knaggs met in Monroe to discuss the resumption of picketing at Newton Steel. This resulted in the creation of strict picketing rules, which favored the city and maintained “law and order.” Picketing resumed, and midsummer passed uneventfully. It had been slightly more than a month since the violence of June 10, and apparently peace had been restored. Knaggs disbanded the citizen police battalion on July 18. The city began to return to normal. Monroe had avoided disaster, and the city could return to the quiet anonymity it had enjoyed before the strike. Monroe was involuntarily cast into the national spotlight from late May through July. It was a position for which Monroe was woefully unprepared. Even so, the city had faired well. Breaking the picket line had not turned into another Chicago. In its aftermath, a union backlash was averted or defused. The remaining question was “Would peace in Monroe hold?”It was likely that people around the country, as well in Monroe, were still waiting for the other shoe to drop. Monroe’s picketing rules, though not perfect, were effective enough to be adopted and adapted for use in other strike-torn areas of the U.S. View the video to share in the experience of the strike. The CIO chose to strike Newton with a local union that was a true minority amongst the mill’s overall workforce. The CIO miscalculated the level of public support the strike would receive and the strike failed. Republic made smarter moves. The company successfully blamed its shut down, which was closer to a lockout, on the pickets. The June 7 vote publicly indicated that the majority of men wanted to return to work. Events played out in such a way that the average citizen viewed the CIO as the villain, and not Republic. In August 1938, Senate hearings investigated allegations of violations of free speech and the rights of labor in Monroe and other Little Steel strikes. The inquiry revealed that Republic had paid Monroe $1,566 for the purchase of tear gas and clubs. 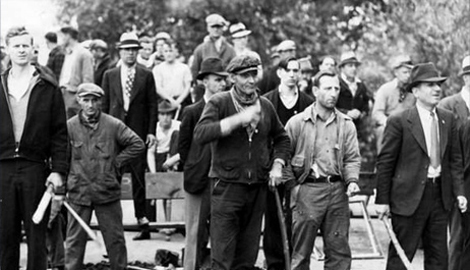 During May and June, 1937, the Little Steel strike in Monroe drew national attention. As Monroe was thrust into the spotlight, so was the mayor. In the days, weeks and months that followed, his celebrity grew. People from across the nation sent cards, letters and telegrams. Many letters congratulated his stance on preserving “law and order,” upholding “Americanism,” and his protection of American ideals. He was hero to some and villain to others. The overwhelming majority of incoming correspondence voiced approval. Some people wrote just to ask if they might somehow be related to Mayor Knaggs. Others urged him to seek higher office. One woman asked for his autograph. Although most of what people wrote about Knaggs—to Knaggs—was positive, letters in the mayor’s mailbag also expressed strong opinions about state and federal government, as well as dislike or even hatred for President Franklin D. Roosevelt, Michigan Governor Frank Murphy, John L. Lewis and the CIO, and Communism. In a small town where most people knew their neighbors, outsiders to Monroe could be easily identified as strangers, and not belonging. It was relatively easy to tell who was part the community and who was not. Speech, dress, nationality, religion, color of skin, political leanings, or union affiliation could promote "outsiderhood." Most Newton employees migrated to Monroe from Newton Falls, Ohio. Slovaks, African-Americans, and other nonresidents rented rooms and boarded in the city. Few were able to purchase homes and most were just not seen as "Monroe people." Monroe's labor struggle contributed to "not belonging." None of the CIO organizers were from Monroe, and one was African-American. Additionally, many people viewed the CIO as un-American, if not Communist. Unions were often viewed with mistrust and claims that unions were anti-American or Communist-controlled were common. After the World Wars, the United States experienced “Red scares,” periods of strong anti-Communist sentiment. During these episodes, unions were targets, from without and from within. The U.S. government effectively shut down the Industrial Workers of the World (IWW), a union considered by many as the model for the twentieth-century modern union, after World War I on suspicion that it was anti-American. Many unions purged Communists from their ranks at the end of World War II throughout the 1950s. Though some labor union members were avowed Communists, their participation in American unionism never resulted in undue influence—or outright Communist control—over any U.S. labor union. Leondies McDonald was a black CIO organizer in Monroe at the time of the strike. He was a native of Hammond, Indiana. Another Leondies McDonald—possibly this Leondies McDonald—was a Communist candidate for governor in Illinois in 1932. Around 10:00 a.m. On Thursday, June 10, McDonald left the Monroe Post Office after mailing some letters. As he left, he noticed a crowd gathering. He managed to get into his car, but was dragged out and brutally kicked and beaten. This continued while McDonald was on the run for nearly a mile. He ran south on Monroe Street toward the city limits before he was picked up by CIO friends and taken to a Toledo hospital. It has never been determined if this incident was purely racially-motivated, or based in hatred for the CIO, outsiders, or Communists. Does anyone know when the monument for the Newton Strike was dedicated? This was a great article about steel strikes, but I don't know if Service Steel ever had a strike. Service Steel opened in Michigan in 1920 selling steel tube and pipe, so maybe they unionized eventually.